We’ve passed some important milestones outdoors on our house. Not only has the lawn been given its final grade, but we now have a driveway and beautiful brick work in place. The concrete sub came by on Wednesday to complete the pour. He was very good at asking questions and figuring out exactly what we were looking for. In the end, we got a driveway that meets city requirements and is exactly what we need. So, okay, 20 feet. Got it. Done. My wife took our two girls to 1120 while the concrete was still damp to stamp their hands. Each one of the kids posed their own unique challenge: Our baby doesn’t like to unclench her fists when she’s happy so she has a hand print with seven fingers. Our preschooler stamped her hands like a boss, but then she wandered to a point halfway between the two closest adults and stamped her foot in the wet concrete. Also like a boss. Fortunately, the broom finish texture hadn’t been applied yet, so the footprint was easily repaired. The concrete guys worked well after dark applying the finish and making sure everything was just right. I had indicated a preference for rounded edges for the steps on the front porch and back patio. I grew up in a house with hard-edged concrete steps that didn’t wear well over time and left a heck of a mark if you ever fell on them. The concrete sub responded that it was a lot of extra work so I said no worries–I’ll just grind the edges down myself later if they prove problematic. I was more than pleasantly surprised to find that not only were the edges rounded, but they looked very handsome–and safe! 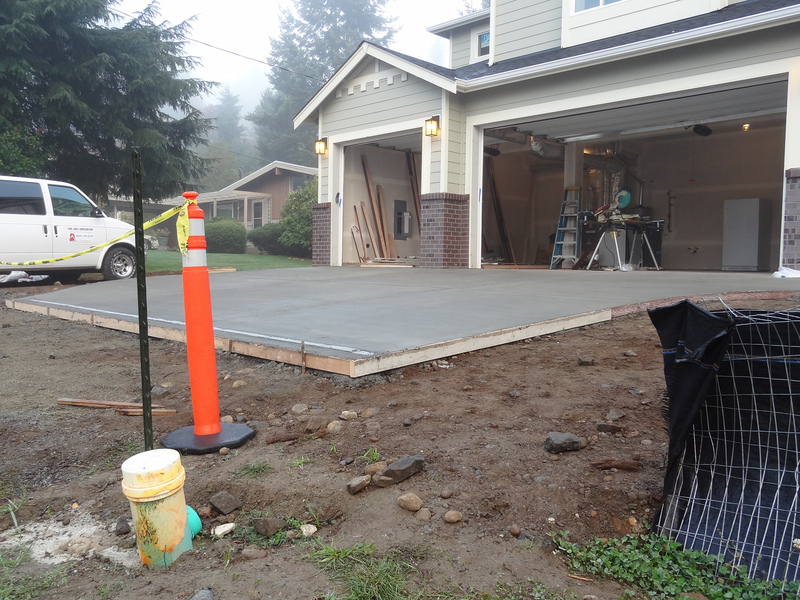 The final bit of driveway will be an asphalt apron that spans the city’s right-of-way. That will get poured in the next few days. My wife and I were at the stone yard picking out the fascia rock for the front of the house when I flippantly pointed out a display with several styles of brick. I grew up in a house that had interior designs made of “brick” that was actually thin red plastic shells mortared onto drywall and I expected this to be a slightly higher-class version of same. After all, the entire selection of stone we were looking at is really just glorified tile that is glued onto the surface. As it turns out, the product my wife fell in love with was the real deal. They are a deep red clinker with hearts (markings where bricks were touching during firing) and chucks (bricks where small chunks are either broken away or other bricks are adhered during firing) mixed lightly throughout. I wasn’t sure at first if it would be worth the extra expense ($800 for two posts and three corners), but I soon realized it made a lot of sense long-term. The fascia stone used on a lot of new construction around here is a hallmark of homes built after 2000. That trend will eventually pass and look dated (as did real stone interior fireplace surrounds that were built in the 50s-70s). My hope is that true brick will better withstand the test of time and will still look nice in 20-30 years. After all, it is one of the oldest construction techniques still in use today. The installers took a fair bit of cajoling before they were convinced that they could even do the job. 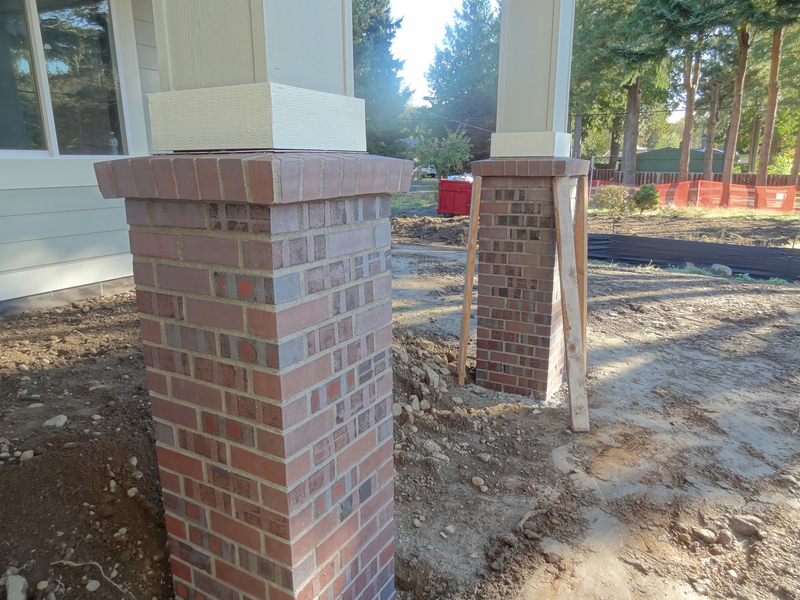 The brick required a concrete footing underneath and the base of the front porch posts needed to be rebuilt for the thicker product. Still, once they set to it, I quickly realized that their work was very high quality and well worth the extra effort. 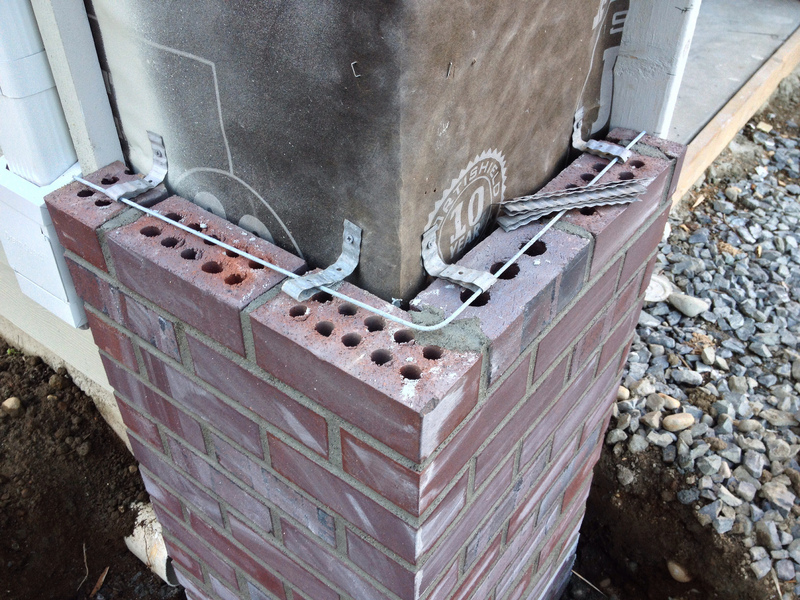 This entry was posted in Construction and tagged brick, concrete, footing, progress, trim. Bookmark the permalink. It’s looking fantastic. How long do have to wait before driving on it? Do you have freezing temperatures where you are? I’ve had them leave the form on my garage floor door entries to keep them from being chipped by equipment. We’ll be doing asphalt next year as I’d like the ground to settle a bit more with the winter snow. Like the brick, your children’s handprints will be there forever. Cool. I think we’re supposed to wait 3-4 days, but the good news is that driving on it isn’t an option anyway since we’ll need to pour the asphalt apron in order to get up onto the driveway proper. Fortunately, Seattle area only gets a handful of nights down in the freezing range each year and that’s typically right around the new year. At our last house, we had a driveway poured on a night that ushered in the longest cold streak in the area for years. The resulting concrete work left much to be desired. I liked your idea about leaving the forms up so we did the same thing for the small garage door on our place. It did the trick because we don’t have any chips!